Also, device-specific hubs address your professional needs. An Open API for USB Hubs? Our Cambronix-powered sync-charge hubs are equipped with a powerful feature: an an open API that allows you to create user-defined scripts to control each port and connected devices. This valuable feature is used in 1000’s of our hubs and is built-in by design. It permits seamless interaction with devices through applications such as GroundControl. Almost all our hubs are built with field-updatable firmware to ensure that you can make them optimally adapt to new USB technologies as they emerge. Do your SYNC-CHARGE hubs charge while syncing? Most USB syncing hubs do not charge devices at more than a trickle rate while syncing. A recent firmware enhancement for our customers permitted them to update their Cambrionix-based (PP and U series) USB hubs to add a valuable feature: the ability to charge while iPads and other devices are in sync mode. This permits you, under some circumstances, to fully charge devices while they are left in sync mode, something that is not possible with conventional sync-charge systems. If you are using devices that can take advantage of this, you can leave your devices connected to a host and still charge them overnight. If the devices are not in active use with displays on full, playing videos, etc., they will go from depleted to charged with this feature. Will the screen display that the iPads are charging? Yes, iPads equipped with Lightning cables will display that they are charging in this mode. Other devices might not. It depends on the device. For hospital IT staff and others using hundreds or thousands of critical smart phones, maintenance and break-fix issues are not easy tasks. UniDock is perfect for iPhones or Android phones in clinical communications, POS and other applications and is fully integrated with GroundControl’s ground-breaking mobility orchestration platform and other software applications. One marquee feature of UniDock is the Self Healing feature of GroundControl. Push a “Heal Me!” button on your phone, and software errors — small or large — are corrected with the next connection to the UniDock. It is as if an invisible technician is sent to repair the phone. 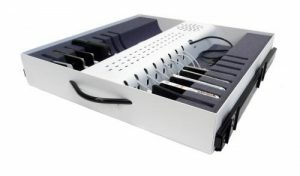 Built on the unique open API and state-of-the-art USB technology of Cambrionix, these docks can be adjusted to practically any common mobile device and case. For hospitals using iPads for medical and patient engagement applications, we offer several solutions. 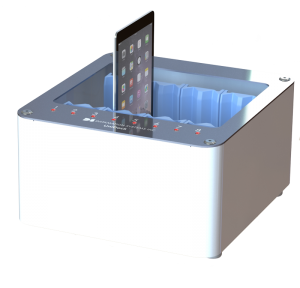 Our UniDock for iPads (coming soon) accommodates 8 iPads and offers all the same features as our other UniDock Smart Hubs. Our Mobile Device Manager with LED status indicators can be used to charge and sync 16 iPads™. It features unique future-proof, field-updatable firmware and the Cambrionix ChaSync+ simultaneous charge and sync when connected to a host. UniDock and MDM is fully integrated with GroundControl’s ground-breaking mobility orchestration platform and other software applications. If you have large data syncing requirements and want to take advantage of the data transfer speeds offered by Thunderbolt, the ThunderSync16 will be the perfect way to meet your needs. 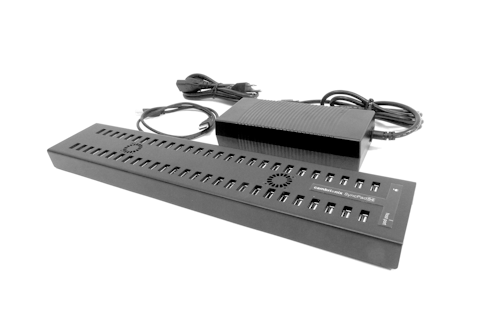 This advanced 16-port Thunderbolt hub developed by our partner, Cambrionix, delivers increased speeds for transferring data between a host thunderbolt connection and 16 attached devices, even USB2.0 devices. It can even be controlled with our open API. The DS-C-U16 is a professional USB charging station that is compact and easy to use. It will simultaneously charge 16 iPads (all generations), iPhones, iPods or any USB 2.0 powered device, replacing bulky power strips and multiple AC adapters. It is designed to provide the optimum power required for the fast, safe charging of these devices. 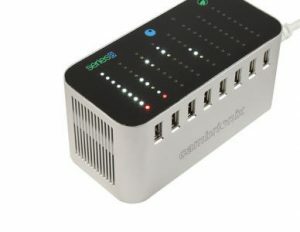 The first truly “universal” USB charging hub, it reads the battery requirements of a connected device and sets the charger for that port. And it is “future-proof” — built with user updateable firmware to handle new devices as they come along. These hubs are used in thousands of facilities — any place that needs fast, reliable, professional, convenient and space-efficient charging capability. They can be used on a desktop, mounted under a counter or placed in a cabinet or cart. The DS-C-U16 works with many other types of USB-powered devices (such as cameras, medical devices and scanners), virtually any device that would charge if plugged into a standard USB-connected AC adapter. 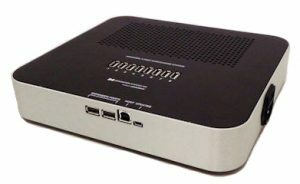 The DS-SC-U16 is a professional-grade desktop hub that provides sync-and-charge capabilities in a compact, easy-to-use form factor. 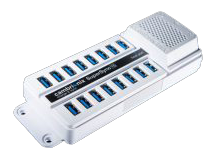 An advanced Cambrionix intelligent USB board is mounted in a custom-made steel enclosure with a power supply, providing 16 USB ports for syncing and charging at the optimum rates for which USB-connected devices (up to 2.1A per device) were designed. Adding even more value, this hub is universal for all USB-chargeable devices, including smart phones, tablets, headsets, and more. It is “future-proof” so new charge profiles can be loaded from the web, assuring it will handle future USB-2.0 devices. (Not all devices are designed to sync via USB). You can use the DS-SC-U16 to simultaneously sync 16 iPads or iPhones using iTunes, Configurator or other device management software with a MacBook or Windows PC. Syncing is easy and fast. This kit is perfect for a tech center, help desk or support depot or in a clinical or nursing station. It can be mounted on a counter or on an existing cart or cabinet, turning your old storage station into a sync-and-charge station. Click here for more information. It also incorporates the open API feature of the most advanced syncing hubs. A charge-only version is also available, Click Here. 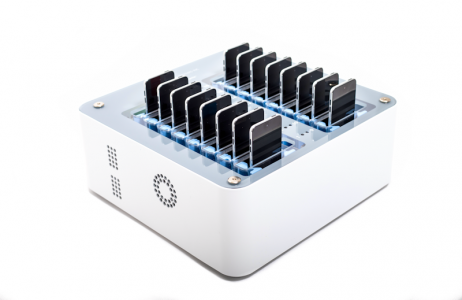 The World’s Biggest USB Hub? We are happy to offer a compact, powerful 54-port sync hub that can be used as a massive sync station. Versions can be rack-mounted and even joined with a second hub to create an even more massive 108-port array – perhaps larger than anything else currently available. This is ideal for copying data to devices like memory sticks, e-readers, etc. and can be used in many different environments. For example, this unit will be very useful updating iOS devices. This advanced tool comes with a cost effective and compact power supply and is specifically designed to comply with USB 2.0 specifications. 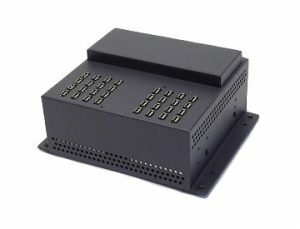 Each port will supply 500mA of current simultaneously, something lesser hubs fail to do, leading to unreliable data transfer or even failure to connect to all devices. It also incorporates the open API feature of our most advanced syncing hubs. The DS-SC-U32 lets you create a sync and charge station for a desktop or as a retrofit for an existing cart or cabinet. Each of its 32 USB ports delivers 2.1A for charging iPads, iPhones and iPods and syncs the same way as the most advanced cart-based hubs. It includes our unique, advanced universal, “future-proof” USB technology. The DS-SuperSync15 is an advanced universal USB 3.0 that can charge and manage iOS and Android devices. It takes full advantage of USB 3.0’s 5Gbps data transfer and full 2.1A high-current charging for each connected 3.-0-capable devices. 5Gbps USB 3.0 speed and high-current charging. It also incorporates the open API and GUI port management only found in the most advanced syncing hubs. The DS-C-Series8 is an intelligent 8-port USB Charge Station perfect for home and office use or as a compact convenience charger for nursing stations and employee break rooms. The Series8 charger is compatible with any device that provides charging via USB cable. It is compact and stylish and can charge up to eight devices simultaneously, making it the ideal choice for home or office use. Like our other Cambronix-powered hubs, they come with the valuable open API feature. If you are deploying or managing multiples of a smaller mobile device — such as iPhone™, iPod™, iPod Touch™ or smart phones — Datamation Systems has created a wide range of storage strategies that incorporate state-of-the art charging and syncing hubs.